Hierarchic Approaches to Modeling Fastened Connections Webinar | ESRD | Engineering Software Research and Development, Inc.
Strategies in engineering simulation for reducing the frequency, cost, complexity, and uncertainty of aircraft maintenance inspection intervals. Comparison of von Mises stress distributions for fastened connection model hierarchies. Hierarchic modeling of fastened connections, including Planar-only (fastener + link + 2D elements), multi-body contact (load transfer between all parts), plug/partial contact (load transfer between notable parts), & normal springs (compression-only single part analysis) approaches. Pros, cons and applicability of each hierarchic approach will be analyzed. CASE STUDY: 3D Lug Comparison – Multi-body contact, plug/partial contact & normal springs. 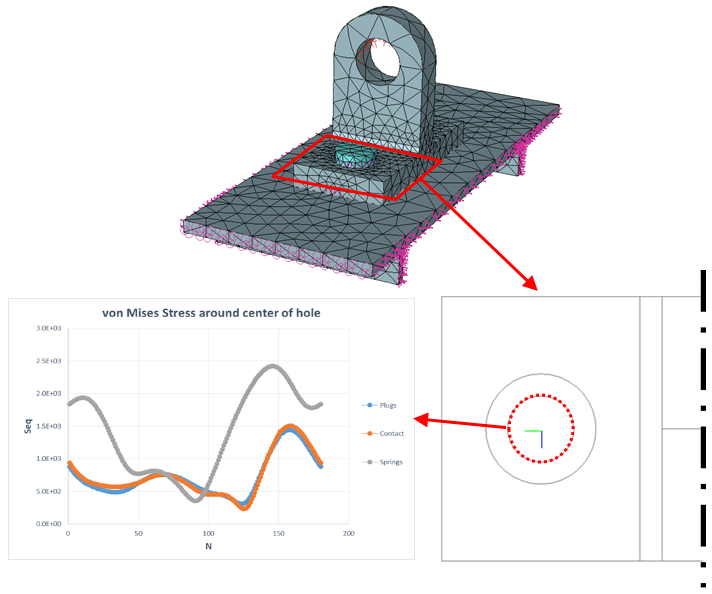 LIVE DEMO: You will learn the process of checking reactions in contact regions/holes, as well as how to perform live-dynamic processing of detailed stresses in multi-part assemblies.